Note: We have released a ProtonVPN app for macOS! If your device uses macOS version 10.12 and above, you can download our app here. The tutorial for our macOS app is here. With this app, you can connect to ProtonVPN directly without Tunnelblick. 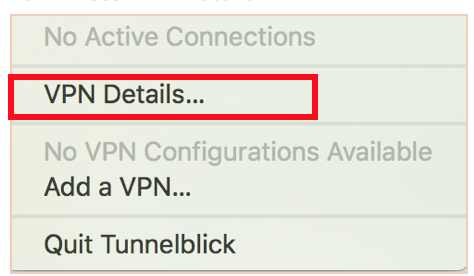 If your device uses an earlier version of macOS, continue reading to learn how to use Tunnelblick to connect to our VPN servers. Tunnelblick is a free, open-source VPN interface that allows you to connect to our network via the OpenVPN protocol. A. Check how to find and set your OpenVPN username and password. – If you already know your OpenVPN credentials, you can skip this step. Depending on your security settings, you will be asked to confirm your Mac password to proceed with the installation. E. Click I have configuration files when you see the window below. Navigate to the Mac menu bar and click the Tunnelblick icon that should be present in the right corner. Drag and drop the configuration files from Step 2-E above into the ‘Configurations’ section as highlighted below. A number to specify a server in that country. For example: de-01 is the first server in Germany; ca-04 is the fourth server in Canada. Files with two country abbreviations are Secure Core servers. For example: is-us-01 is the Secure Core connection through Iceland to the USA. D. Enter your OpenVPN username and password from Step 1 above. Note this is not your ProtonVPN account username or password. To add more connections, repeat Step 4-C above with different configuration files for your choice of server or country. How to install ProtonVPN on Linux? 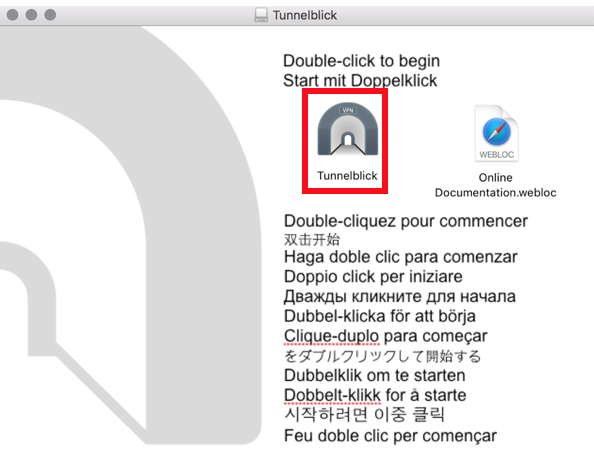 having OSx 10.11.6 i’m forced to use TunnelBlick, but into the step 2.D. (“Download ProtonVPN configuration files”), the download of configuration files is not permitted to Free plan user, so i have to assume that not being an 10.12 or above user i can’t try this service, isn’t it? Hello. Even if you are free, you can download our FREE configurations from your account page, just find the servers in these countries with FREE tag – US; Japan; Netherlands. 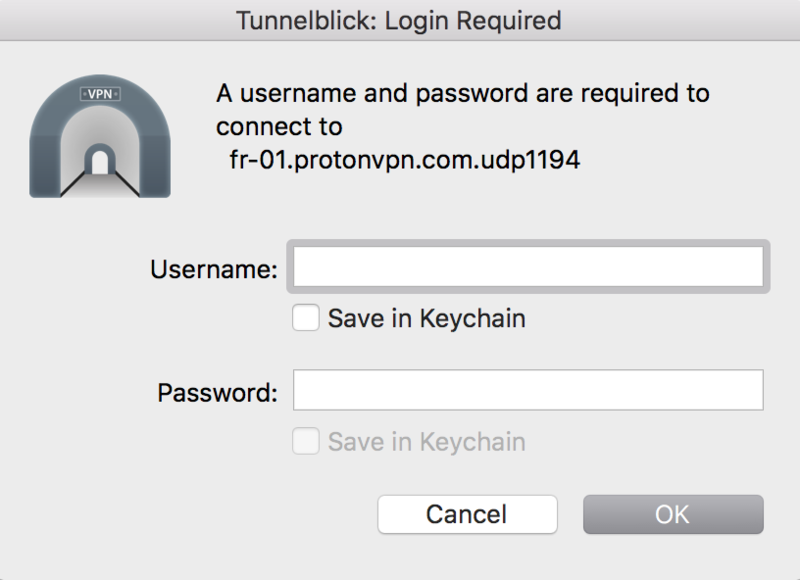 If we are using the ProtonVPN for MacOS (not TunnelBlick), it looks like we need to use ProtonVPN credentials vice OpenVPN credentials for logging in and to connect to SecureCore and other VPN servers. Is that correct? So essentially when the MacOS and iOS versions are finalized and published, we will need to just concern ourselves with our ProtonVPN/Mail account vice the OpenVPN account as well? Hello. If you are using our application and you are asked for the OpenVPN credentials, you should reinstall it as there is a handling issue somewhere on your machine. On apps, credentials should be handled automatically after you have signed in to your account on the software, that will be the same for the iOS application. Any plans to support WireGuard? Hello. For now, we currently do not have any plans for WireGuard support. Nonetheless, thank you for the suggestion to do so. Hello, We do not personally recommend using two VPN`s (apps) at the same time as it can cause some issues with colliding network settings. We would suggest simply using Secure core servers within our Mac application as that will be the easiest way for you. Hey I am not sure why there is a free option for this service but I cannot download it? Our Mac beta application is only for paid users, so free users cannot download the application. Sincere apologies about that. Hi, on MAcOS it’s possible to switch server ( country ) and have a route all config with the native BETA client ? Hello Cris. Yes, you can switch between the VPN servers within our macOS beta application as in any other our application and you whole mac internet traffic is being routed through the VPN server. Could you please try the same server with TCP configuration? Also, are you sure you are downloading mac configuration files? Hi, i keep getting “can’t connect to server” when I try to login to the protonvpn account page. is this because of maintenance? Thank you for reporting this and we appreciate your concern. We had some issues with the website that are fixed now. Sorry for disturbances. Why using tunnelblick??? The normal way to integrate VPN i.e. MACOSX 10.11 is to have the VPN server adress, accountname, a password and in addition a secret name (or key). This all can manually set up via your network configuration in “system configurations” on you’re MAC. Apple wil give you the choice to make use over interface VPN via IKEv2, Cisco IPSec, PPTP or LT2P over IPSec. Via IKEv2 (what ProtonVPN is using) you need a serveradress, Externe ID, Lokale ID and by preferences you’re username and password—-> and GO! Would I miss something? Tunneblick provides OpenVPN client while what macOS internaly provides does not have this portocol. We are currently working on Mac beta application which uses IKEv2 protocol and all paid users can take part in beta testing. You can download our macOS application when you log in to your profile on protonvpn.com. On right side menu you will see Mac Beta tab, there you will be able to download it if you are a paid user. tunnelblick is popping up with a error message saying that the config files are using a config that is depreciated. I was wondering, since you don’t store any log or user personal information, does TunnelBlick store any of that? Like my local IP or something else. Plus, I checked that of all of DNS queries are sent to the IP’s ISP RouteLabel V.O.F. All of DNS servers are managed by protonVPN? Can I choose/control which DNS server to use? Also, are DNS queries stored? Tunneblick is an opensource openvpn client that does not store any of user information. Its just a client to initiate VPN connections. Each VPN server runs DNS server on it too, so DNS request are handled by ProtonVPN and same no log policy is applied. Would love to use ProtonVPN, but I need a L2TP over IPSec protocol to connect (due to network block with other protocols). Would you provide this protocol? Sadly we will never provide this protocol availability due to the security flaws that it has, sorry about that. Hey, when will you release the application for mac?I tried to use tunnelblick but when i try to connect with the server it connects without ending. Our Mac VPN application is released in a closed-beta, and only our paid subscribers are eligible to receive an invitation for early access. Regarding the official release date, we are unable to provide a specific date or a time-frame as the application is under active and intense development/optimization. I’m not seeing any free servers in either Canada or the UK. Are there any? hey. I love protonvpn. but, what about an native macOS client? I think I heard there is a closed beta for it? I would be very happy if I could join this program to make the software even better. I have some experience in beta testing. Hello, if you have a paid ProtonVPN account, you can e-mail us via https://protonvpn.com/support-form and we will send you an invite. VPN config/ch-ca-01.protonvpn.com.udp1194.ovpn’ contains characters that are not allowed. Hello Adam, most likely you are using those special characters in your OpenVPN password – you can check that in https://account.protonvpn.com/settings. If you do, please try to change your password into an alphanumeric one and see if this will solve the issue. Can you provide an updated ETA for the native Mac and iOS clients please? Our macOS app is currently in being tested in closed beta, for iOS we are hoping to have something out in late Spring. How is it going with a native Mac client or integrating ProtonVPN into standard macOS VPN flow? You promised more info by end of 2017, but still nothing new. Thanks! The native ProtonVPN Mac application is released in closed-beta, and only our paid subscribers can get an invitation for early access by request. We cannot provide a certain date regarding the official release, as the app is under an active development and optimization. The P2P servers are marked with two arrows. Could you specify in which phase of the setup you are experiencing troubles? We have released our ProtonVPN Mac application as a closed-beta, and only our paid subscribers can gain access to it by request. The application is still under development, and we are unable to provide a specific date for the official release. The iOS application is still being developed, as we want to ensure that we release the best products on the market. We appreciate your kind words, have a great time! open vpn and tunnelblick are a bag full of pain! it renders protonvpn completely useless… is there a possibility to connect a fritzbox directly to protonvpn? Our native ProtonVPN Mac client is released in a closed-beta version, but it’s under an active development. Our paid subscribers can get an invitation and access the application by request. Regarding the official release, we are unable to provide any certain date at this time. It is now 2018 and many of us still waiting on the native iOS/OS Proton VPN client. The native ProtonVPN iOS client is still under development, and we are unable to state a certain date or a time-frame regarding the release. The ProtonVPN Mac application, however, is released in a closed-beta which only our paid subscribers can access by request, but it’s under an active development. I can not download any configuration files as states in #2 above… Whenever I hover the mouse over an item on the downloads page I see a “Plan Upgrade Required” message. I am on the free plan, am I eligible using this software? When exactly is ProtonVPN going to have a native Mac client? We have now the beginning of a new year, so I ask the question again: When exactly is ProtonVPN going to have a native Mac client? The native ProtonVPN Mac application is released in a closed-beta version, and it’s under an active development. However, our paid subscribers can get an invitation for the early beta access by request. Well, we’ve passed the end of 2017, so I’m wondering when the native Mac client for ProtonVPN will be ready? The ProtonVPN Mac client is released in a closed-beta version, but it’s only accessible to our paid subscribers by request. The application is still, however, under an active development and it’s constantly improved. Regarding the official release, we cannot specify a certain date. So by end of this year you meant 2017 right… well sorry to tell you… When can we really expect it because i love the idea you have here with this free VPN compared to others but having to install and do so much myself isn’t up my skill tree. Our ProtonVPN Mac application is released in closed-beta at this time. Only our paid subscribers can get an invitation for early access, and the app itself is still under an active development. We cannot specify a date regarding the official release. Any update on release or beta use of Proton VPN for Mac OSX & IOS users? I’d like to change my VPN and like many others would prefer a Proton solution. Can you provide a timeline or if no timeline exists, provide users a reason for the delay? I.E. funding, lack of demand, etc. so we have a plan for home network security? The reason that the Mac VPN application not yet released – is that we want to ensure that the application is fully optimized before we announce it officially. Hello Trevor, if you have a paid subscription, please contact us via our support form for a closed beta invite. It gives me a prompt of installing configuration for all users or for only me, but I don’t know what this is referring to. how to use proton vpn with an apple tv? Tested on MacBook Air Pro connected to home wifi and the result is connection speed is just too slow to browse anything. Tested on MacBook Air in public Wifi and it does not even pick up enough speed to connect to the internet. 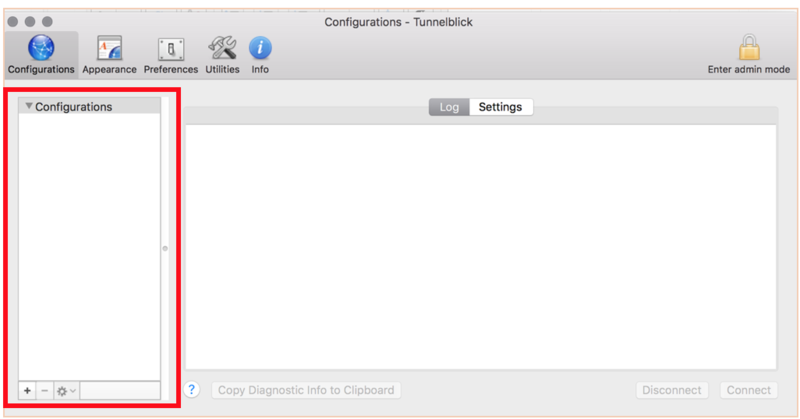 Tunnelblick is not responding to connect nor disconnect. Please advise any ideal set up for someone based in Japan and wanting to use the France VPN? Hi is there a way to setup the VPN connection native on the mac rather than tunnelbick? simply connect to one of the TOR servers (us12, ch5, hk5) using the apropriate configs and your network will automatically be routed through the Tor network. Can we have a setup for native Mac OSX under System Preference -> Network -> Add VPN? I found that setup to be simpler, except I have to choose from a list of VPN server manually. I’d like to sign up for Protonmail mail and VPN (pay versions). I work with the Mac platform, from Sierra down to 10.5.8. Can you tell me whether your VPN will work on my older machines (e.g. Mac G5 running OSX 10.5.8 leopard or a Mac G4 running the same OS)? Thanks in advance for your attention. just in case you don’t realize it, but the average apple user (me) has been pre-conditioned to ignore any software with that kind of installation process. Hey there! SInce I’m using MacOS & the ProtonVPN natice client isn’t yet available to me, I was wondering if there was a way to know in what parts of the US the various VPN servers are located? I’d like to find the closest server to my physical location (in order to reduce lag, etc.). This is really crazy UX 🙁 We have tons of other VPNs with much easier UX and super friendly apps including iOS. Why do we need this one instead? Where is the pretty dashboard ui from the landingpage?! Currently that client is windows only and the mac client is in development. We’ll have more info in q4 this year. The Tunnelblick/protonvpn combo was working earlier this evening. Now: Will not accept my password (I’ve tried changing it), and fails to disconnect. Thought I follow all the directions. Trying to login but nothing happens. The “Waiting for password clock just keeps going on and on. Right know it is at 7 minutes and still going… Please advise. ProtonVPN Free configurations are working great with Tunnelblick on MacOS v 10.12.5. Thank you. I am getting the error below. Is it because of my corporate firewall? How do I connect to TOR servers? Guys, where I am, they don’t let us access tunnelblick site either! Why can’t i use IKEv2 on MacOS? Sierra supports it without any third party apps. Just want to double check… The configs etc. are they changing/have they changed since coming out of beta? I’ve had the original configs since the beta launched months ago and have just upgraded to a paid plus member, so I’m looking to make sure that I’m running the most up to date configs and servers for my tier of package? Recommend you to download the new files. Some of the configs related to secure core have been added/removed as we reconfigured our network. We’ve also added new nodes since the original beta launch. I can’t see what I might be doing wrong, please help! MacOS with Tunnelblick and ProtonVPN’s config files. All connections I’ve tried (Netherlands, Sweden, Switzerland, UK…) fail on DNSleaktest.com. It finds a huge number of servers and lists all of them as belonging to Google as the ISP. Have I missed a setting, or is this to be expecte given that it’s beta? This is not expected. 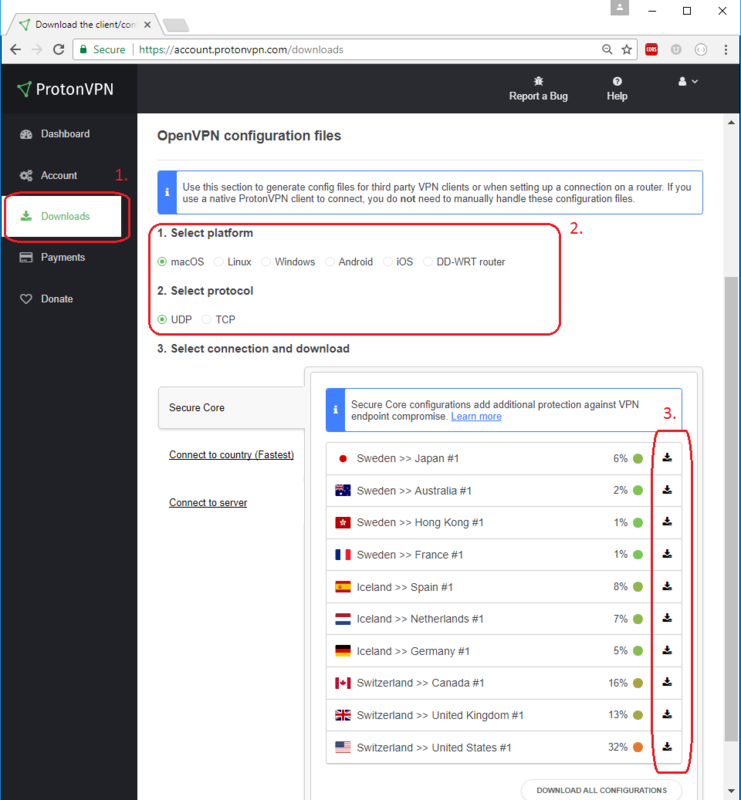 Can you please drop us a line via the support form (https://protonvpn.com/support-form) to properly troubleshoot your setup, thanks! Which option is best for ProtonVPN? Does it make any difference? Can you take in consideration using port 443 instead of 1194? In some environments you will not be able to “get out”. In going through the advanced settings, it seems there is a box called “route all IPv4 traffic through VPN” that is unchecked by default. Isn’t it dangerous for this to be unchecked? I checked it but didn’t really notice a difference. What is its purpose and why would someone want it unchecked? Usually this sort of box is just used for corporate VPN stuff I think but since most people probably use ProtonVPN for always-on safety, seems like it should be checked. OpenVPN works fine as long as someone is fairly techie. Like others, I easily had this working on my Macs and within iOS using the OpenVPN app. That said, a native ProtonVPN app for Mac and iOS is an absolute imperative, otherwise I’ll be setting it for my wife and coaching others how to configure and get connected and I already have far too much to support as it is. OSX 10.12.4 no problems with Tunnelblick, i was using Vyprvpn but im sticking to Protonvpn nice job! After installing the config files in Tunnelblick, in settings the check box “Route all IPv4 traffic through VPN” is deselected by default and “Disable IPv6 (tun only)” is selected by default. Is this correct, it seems to me I should be routing all my IPv4 traffic through the VPN? Just loaded OS 10.12.4 with Tunnelblick with no problems! The [CMD]+[Shift}+[R] not working in my Safari browser to change the need from Visionary plan to Plus plan allowing to join the VPN. Already installed all the tools and they work fine, except the password – which I guess I need to wait to go to the Plus Plan. Question: Do you have to be on the Plus Plan in advance before attempting to join in the VPN ? Will this change in the future whereby one has to be on the Visionary Plan? Hi Shai, try using [Opt] + [Cmd] + [E] to clear your cache and then retry the refresh. If this issue persists, please drop us a line via the support form. Hint: you need to have the Visionary account. Just to say that normally I use Freedome VPN – so I’ll be comparing. 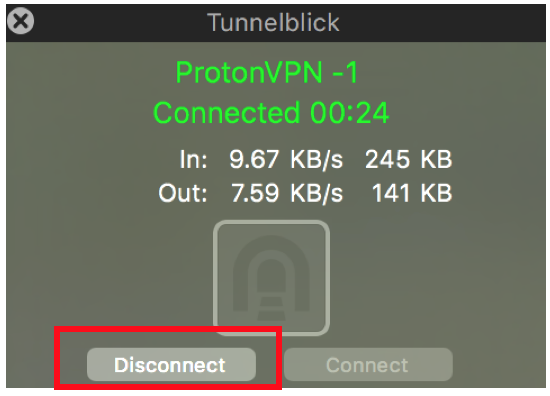 TunnelBlick will open, but when I try to drop the ProtonVPN_config file it won’t drop in the TunnelBlick window. I’m not sure how to solve this. I get that this a Mac forum not an iOS forum for this VPN service. I’m not really sure I need this, as I researched last night and found the letter JFK wrote right before George HW Bush shot him, then I found docs and photos of Majestic 12 and the Magic group assigned first by Harry Truman then Dwight Eisenhower, concerning the Zeta Reticuli grey aliens and so forth and how to deal with it etc … and I am betting had I had a VPN this would not have found its way to me but I don’t know, maybe I do need one. Then all the maps of all the alien underground tunnels and bases worldwide, etc etc. If I do need this, perhaps a user or the Proton staff might just send me an email with what I need to do and the info needed rather than a zip file and gosh, I will go ahead and join the other beta testers, but my surfing habits are fairly mundane so I don’t know I might bore someone to death. But, if you’d like to send me what I need, my email address is here and legit via ProtonMail and let’s party! I have a ProtonMail Plus account. I have Tunnelblick 3.7.0 (build 4790), and I imported the all the US config files. I was able to log in successfully, however I couldn’t resolve anything after (e.g. couldn’t access Google, etc.). Are there any options that I need to set on my client so that it leverages the DNS information propagated by the VPN server? I am having the same problem. Same configuration. I can change the server I connect to but in my web browser, it does not resolve the host names. So … how to tell if we’ve successfully implemented this? Can’t get this to work on OS Sierra 10.12.3 (16D32) with Tunnelblick – It keeps hanging on ‘Waiting for password’. Any suggestions? N.B. I’m a Protonmail Plus user. I’m about to install this on iOS 10.12.4. Anything I should know? I keep getting the message: “The username and password were not accepted by the remote VPN server.” no matter which server I try to access. I used my ProtonMail username and also tried my main ProtonMail e-mail address, as usernames, with the new password I set up using your instructions. Hi Stephen, when conecting using Tunnelblick, you need to user your OpenVPN credentials as described in step 6 above, not your ProtonMail username and login password. It’s been at least a week since I posted here, requesting assistance to get Proton VPN / Tunnel Blick working with 2-factor authentication. I also posted about Tunnel Blick’s published hash disagreeing with the computed hash, raising concerns that the Tunnel Blick download is corrupt and might contain malware. To date, I haven’t received a response to either issue. Also, the last post showing on the site hasn’t changed during this period (“Rob” posted on 12 March 2017 at 5:43 PM). All of this leads me to conclude that ProtonVPN isn’t staffed and therefore is unprepared to conduct a beta trial. I would prefer to leave Tunnel Blick installed and possibly wait a bit longer, but the probability of the download containing malware seems non-trivial. So I’m going to uninstall it and subscribe to another VPN service. Hope you get ProtonVPN working someday … it’s a great idea. Hi Dave, re changing openvpn pw: going by your description, the second box should be where you input your current protonmail login password to authorize the credential change, not a repeat of your ovpn pw. The most surefire way to reach our support is dropping us a line via the support form at https://protonvpn.com/support-form. Happy testing. I’m curious if openvpn from Homebrew works for OSX? I had problems in the beginning but the connection is working now. I was stuck some weeks ago because the open VPN config in protonmail asked me to change my password and I had no clue what the old password is supposed to be because I never had one. Today it occurred to me that the open password maybe my mail password and indeed that was the case. Works great for me just imported the .opvn configuration files downloaded from the Protonsite into the Openvpn app file sharing function with my iPhone hooked up to iTunes and then the login credientials supplied by Protonmail. I think it’s awesome that you guys are offering this on top of already great email. Protonchat soon ? lol. Also would be awesome to have a zero knowledge storage solution as well. Will be a paying customer for the VPN as well once this comes out. Any help with the ‘Waiting for password’ issue would be appreciated. I’ve tried pretty much everything on here with no success. If you copied your login from ProtonMail and look closely after pasting it in, you might notice that it also copied in a new line that you can’t initially see that says “CHANGE OPENVPN LOGIN”, which is the text on the button directly below the login. After deleting that and the new line, it worked for me! The username and password were not accepted by the remote VPN server. Hi Jame, glad its working for you, it would be very helpful for other users if you could document what solve the issue for you. Happy testing. Jame, I have the same problem that you are describing, How did you solve the problem with the VPN? I think he made a simple pasting mistake when pasting in his OpenVPN login. If you copied your login from ProtonMail, if you look closely, you might notice that it also copied in a new line that you can’t initially see that says “CHANGE OPENVPN LOGIN”, which is the text on the button directly below the login. After deleting that and the new line, it worked! A fantastic addition to our online security arsenal that I have been looking for, for some time. I tried a few other providers but they were very flakey, especially on iOS so I have high hopes for this. Works great on my macbook air with macos sierra. Thanks! Does your connection say “waiting for password” all the time? This is Macbook Pro 13″ retina. MacOS Sierra 10.12.3. Safari 10.0.3. Chrome 56.2924.98. Installed ProtonVPN + Tunnelblick. Connected to UK, received UK IP address. BBC iPlayer did not play video, even after all recommended steps. Connected to all four Australian servers. Received Australian IP addresses. ABC iview (iview.abc.net.au) – every time – refused to recognise that I was in Australia. Thus no video playable. SBS on Demand (http://www.sbs.com.au/ondemand/) did not tell me I was not in Australia, but likewise would play no videos. I had no such problems with my previous VPNs, neither with Astrill nor with ExpressVPN. Since I do receive the desired IP address abroad, I assume that the problem is with Tunnelblick. I only hope that when the ProtonVPN native support becomes available for MacOS and iOS, that no similar problem will arise. Meanwhile, should/must I try to approach Tunnelblick for a solution? Last comment posted (mine apparently) on March 16. Reply “Your comment is awaiting moderation” posted March 16. Step 1 – Install Tunnel Blick. I downloaded per the instructions, then for safety, checked the hashes. They DIDN’T match the hashes documented in https://tunnelblick.net/downloads.html . So I erased that download and instead downloaded using the “Stable Tunnelblick 3.7.0 (build 4790, OS X 10.7.5+, Intel-64 only) released 2017-01-30” link, then computed the hashes, which matched. Probably a nit, but given the state of the world today (which increasingly necessitates a VPN), it might be a good idea to reference a download whose computed hashes match the author’s documented hashes. I have 2FA enabled for my ProtonMail (Plus) account. The instructions work OK up to step 6 where I go to ProtonMail Settings > VPN to set the OpenVPN password. I enter the new OpenVPN password I’ve created, another dialog displays requesting the password (again) plus the two-factor passcode. I generate a 2FA passcode using Google Authenticator, exactly like I do when I login to ProtonMail. A reddish-colored box pops up saying “Incorrect login credentials”. Multiple attempts, all failed. Refreshed the web page (using Apple Safari), same results. I’m not going to disable 2FA, not sure what to do. Any ideas? can someone walk me through setting this up on ios (iPhone 6S)? Got it working on my iPhone 7 Plus with OpenVPN, emailed the file. Can’t wait to be released so I can purchase it. I am using Viscosity, but I want to use a different one and I am looking at IVPN as well. Using a MacBook Pro and Viscosity got it all working. – Entered my new (OpenVPN) credentials setup and voila! Another great client for macOS is Shimo https://www.shimovpn.com/ it’s not free, but does come with the https://setapp.com/ subscription. Being able to setup triggers works great for me. I’ll give this a try using open-vpn on dd-wrt and will report back. Presently I’ve been using IPVanish with a custom script that pings all servers and selects the fastest ping result to connect to every 6 hours. I’m pretty excited to try your service. I’d gladly switch over if the speeds are up to par and you guys are serious about not retaining any logs. Looking forward to supporting your development and the Proton brand. Quick request, in the development of your client software make sure you implement a dead switch to ensure no leaks in the case that a VPN connection is dropped. While not a problem, I thought the following information might be useful in resolving what might be a possible bug in your system. I have been using ProtonVPN successfully, both in Windows 10 and on a Mac. I also have an account with Express VPN, which I have used in the past. While ProtonVPN seems to work fine, I have noticed the following difference when I have the VPN on and visit the Weather Underground site to check the weather here in San Francisco. What is strange is that, when Express VPN is on and I go to Weather Underground, if I have chosen, say, Switzerland for my VPN server, it displays the temperature in Centigrade. In other words, it seems to know my computer’s IP address is in Europe. This, however, does not work with Proton VPN–it always displays the temperature in Farenheit, regardless of which VPN server location I choose. As I said, this little detail may not be a big deal, but I thought you would want to know. Let me know if you have an explanation. It’s working on my MacBook Air with Sierra 10.12.3. I’ve used Tunnel Blick in the past and I noticed that it has been refined a bit lately. Nice. Looking forward to the native Proton Mail VPN client for Mac and Linux, though. The Tunnel Blick app doesn’t even open on my MacPro tower. We are dead in the water even before we started. I got it loaded and it seems to work on my Mac OS X 10.11.6. It would be handy if you would identify the various servers by their approximate location. Sometimes I like to choose my exit node based on location. Agreed. There are 12 POP’s for the United States and we have no idea where we are connecting to. It’s a big country and hoping 2,500 miles away is going to slow anybody down. In case you were still wondering. Profile 1-4 is VA, 5-8 is SJC, CA, 9-11 is PHX, AZ. You can also create your own dynamic connection ovpn file so that you can connect to “random” locations of your choosing. The key to getting it to work is to include “udp” at the end of the “remote” line. An example – I pulled the IPs from the US server selection and moved remote-random before the remote choices. Not sure if that really matters, but it makes my brain feel better and it works. So every time you disconnect/reconnect you can connect on a new location. Hi Vault7, we’ll be releasing country level configuration files in the near future. Happy testing. The instructions above say that when asked for your password go to protonmail settings VPN tab and set it. I received an email to test this new feature as a “ProtonMail Plus Supporter”, yet under my protonmail settings VPN tab, I am prompted that the beta is only available for Visionary accounts. I tried to log out and in again, but it seems to stay the same, so I cannot test this or follow the instructions. Hi Anastasia, please try to force refresh your ProtonMail page, either through your browser setting or using OS specific hotkeys (Win: [Ctrl] + [F5]; Mac: [Cmd] + [Shift] + [R]). This should update your inbox to the latest release, where we updated the access privilege for Plus users. you guys far more if you now offering this then im moving it to you. service better and more secure for your community to go online. Hi furphyscuffle, please try to hard refresh your ProtonMail inbox, either via browser settings or trying a hotkey (Win: [Ctrl] + [F5], Mac: [Cmd] + [Shift] + [R]). This should update your inbox to the latest release where we updated the privileges of Plus users. Hi HSausa, please try to hard refresh your ProtonMail inbox. Todo so, either go through your browser settings menu or hitting [Ctrl]+[F5] on Win, or [Cmd]+[Shift]+[R] on Mac. This should update to the latest release with the right privileges. Hi Flo, please get in touch with support and we’ll be happy to help out. It’s now telling us we need a visionary plan, not the plus as mentioned in the email from you all. I followed the instructions, however I keep getting a “Waiting for password” message, even though I’ve typed my login and password from ProtonMail. Any suggestions? similar problem. In case they have suggested some solution (or you have figured out by yourself) please share. Seems worth mentioning that I got it working for iOS as well using OpenVPN! Hi, can you explain how you did this? Would like to do the same! Thanks! Can you be more specific ? What did you do exactly to get it work on ios? 1. Install OpenVPN via the app store (the client is called OpenVPN Connect from OpenVPN Technologies). 4. View that email message and tap on the *.ovpn file(s) to download to your phone. 6. OpenVPN will open and let you know “New profiles are available…”. Click the green dot with a “+” in it to save the new profile. 7. Log in with your OpenVPN login credentials (found under the VPN tab within your ProtonMail account). Since the login and password are likely to be pretty long, it’s a good idea to use the “Save” option so you don’t have to type them in again. Tip: The OpenVPN interface for iOS is a little odd. To start the VPN next time, toggle the unlabeled switch just below the line that says “Disconnected.” You’ll immediately connect to ProtonVPN. Hope this helps. If I forgot anything or was unclear, someone should correct me. Cheers! Thank you for the very clear description. Got VPN up and running on iOS in no time. (5) In GoodReader I navigated into the folder with the un-zipped .opvn files and tapped on one of them to open it. Then I tapped on ‘More…’ and that displayed a list of apps including OpenVPN …woohoo!! (6) I used OpenVPN to open the .opvn file and it imported the file into OpenVPN and then OpenVPN showed me that it was ready to be imported. (8) Then I used the user ID and password I just setup in ProtonMail and I plugged those into the OpenVPN app. (9) Then tap to switch on the connection in OpenVPN and Shazam! It worked. I could tell because on the top line on my iPad I saw [vpn] to the right of my carrier’s name. I’d love more details on getting this to work on iDevices as well. Can you link to which OpenVPN client you used? Very cool. I got this working with Viscosity.